Hence / can be evaluated. The accuracy of the photoelastic technique is limited, among other things, to the accuracy with which the fringe order at the point under investigation can be evaluated. It is not sufficiently accurate to count to the nearest whole number of fringes, and precise determination of fractions of fringe order at points lying between fringes is required. Conventional methods for determining these fractions of fringe order are termed compensation techniques and allow estimation of fringe orders to an accuracy of one-fiftieth of a fringe. The two methods most often used are the Tardy and Senarmont techniques. Before either technique can be adopted, the directions of the polariser and analyser must be aligned with the directions of the principal stresses at the point. This is achieved by rotating both units together in the plane polariscope arrangement until an isoclinic (§6.19) crosses the point. In most modern polariscopes facilities exist to couple the polariser and analyser together in order to facilitate synchronous rotation. The procedure for the two techniques then varies slightly. Quarter-wave plates are inserted at 45° to the polariser and analyser as the dark field circular polariscope set-up of Fig. 6.24. Normal fringe patterns will then be visible in the absence of isoclinics. The polariser and analyser are rotated through a further 45° retaining the dark field, thus moving the polarising axes at 45° to the principal stress directions at the point. Only one quarter-wave plate is then inserted between the model and the analyser and rotated to again achieve a dark field. The normal fringe pattern is then visible as with the Tardy method. Thus, having identified the integral value n of the fringe order at the point, i.e. between 1 and 2, or 2 and 3, for instance, the fractional part can now be established for both methods in the same way. The analyser is rotated on its own to produce movement of the fringes. In particular, the nearest lower order of fringe is moved to the point of interest and the angle 6 moved by the analyser recorded. It can be shown easily by trial that the sum of the two angles 0 and 4> is always 180° There is little to choose between the two methods in terms of accuracy; some workers prefer to use Tardy, others to use Senarmont. Fig. 6.24. (a) Circular polariscope arrangement. Isoclinics are removed optically by inserting quarter-wave plates (Q.W.P.) with optical axes at 45° to those of the polariser and analyser. Circularly polarised light is produced. (Merrow.) 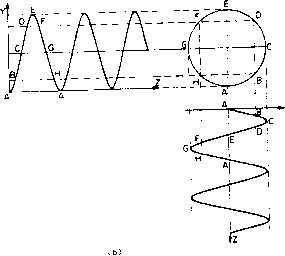 (b) Graphical construction for the addition of two rays at right angles a quarter-wavelength out of phase, producing resultant circular envelope, i.e. circularly polarised light. If plane-polarised light is used for photoelastic studies as suggested in the preceding text, the fringes or isochromatics will be partially obscured by a set of black lines known as isoclinics (Fig. 6.25). With the coloured isochromatics of a white light source, these are easily identified, but with a monochromatic source confusion can easily arise between the black fringes and the black isoclinics. It is therefore convenient to use a different optical system which eliminates the isoclinics but retains the basic fringe pattern. The procedure adopted is outlined below. Fig. 6.25. Hollow disc subjected to diametral compression as in Fig. 6.18(a) but in this case showing the isoclinics superimposed. 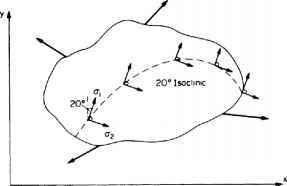 An isoclinic line is a locus of points at which the principal stresses have the same inclination; the 20° isoclinic, for example, passes-through all points at which the principal stresses are inclined at 20° to the vertical and horizontal (Fig. 6.26). Thus isoclinics are not peculiar to photoelastic studies; it is simply that they have a particular relevance in this case and they are readily visualised. For the purpose of this introduction it is sufficient to note that they are used as the basis for construction of stress trajectories which show the directions of the principal stresses at all points in the model, and hence in the component. Further details may be found in the relevant standard texts. Fig. 6.26. The 20° isoclinic in a body subjected to a general stress system. The isoclinic is given by the locus of all points at which the principal stresses are inclined at 20° to the reference x and y axes. 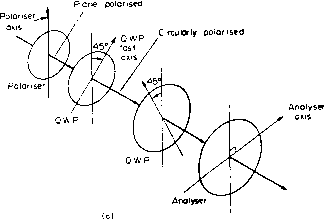 To prevent the isoclinics interfering with the analysis of stress magnitudes represented by the basic fringe pattern, they are removed optically by inserting quarter-wave plates with their axes at 45° to those of the polariser and analyser as shown in Fig. 6.24. These eliminate all unidirectional properties of the light by converting it into circularly polarised light. The amount of interference between the component rays emerging from the model, and hence the fringe patterns, remains unchanged and is now clearly visible in the absence of the isoclinics. The photoelastic technique has been shown to provide principal stress difference and hence maximum shear stresses at all points in the model, boundary stress values and stress directions. It has also been noted that there are occasions where the separate values of the principal stresses are required at points other than at the boundary, e.g. in the design of components using brittle materials. In this case it is necessary to employ one of the many stress separation procedures which are available. It is beyond the scope of this section to introduce these in detail, and full information can be obtained if desired from standard texts. *8,9'The principal techniques which find most application are (a) the oblique incidence method, and (b) the shear slope or "shear difference" method. In the preceding text, reference has been made to models of uniform thickness, i.e. two-dimensional models. Most engineering problems, however, arise in the design of components which are three-dimensional. In such cases the stresses vary not only as a function of the shape in any one plane but also throughout the "thickness" or third dimension. Often a proportion of the more simple three-dimensional model or loading cases can be represented by equivalent two-dimensional systems, particularly if the models are symmetrical, but there remains a greater proportion which cannot be handled by the two-dimensional approach. These, however, can also be studied using the photoelastic method by means of the so-called stress-freezing technique. Three-dimensional photoelastic models constructed from the same birefringent material introduced previously are loaded, heated to a critical temperature and cooled very slowly back to room temperature. It is then found that a fringe pattern associated with the elastic stress distribution in the component has been locked or "frozen" into the model. It is then possible to cut the model into thin slices of uniform thickness, each slice then being examined as if it were a two-dimensional model. Special procedures for model manufacture, slicing of the model and fringe interpretation are required, but these are readily obtained with practice. A special adaptation of the photoelastic technique utilises a thin sheet of photoelastic material which is bonded onto the surface of a metal component using a special adhesive containing an aluminium pigment which produces a reflective layer. Polarised light is directed onto the photoelastic coating and viewed through an analyser after reflection off the metal surface using a reflection polariscope as shown in Fig. 6.27. Fig. 6.27. 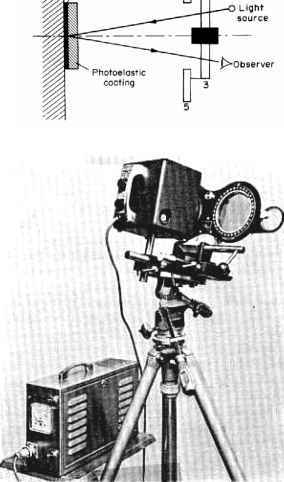 Reflection polariscope principle and equipment. A fringe pattern is observed which relates to the strain in the metal component. The technique is thus no longer a model technique and allows the evaluation of strains under loading conditions. Static and dynamic loading conditions can be observed, the latter with the aid of a stroboscope or high-speed camera, and the technique gives a full field view of the strain distribution in the surface of the component. Unlike the transmission technique, however, it gives no information as to the stresses within the material. Standard photoelastic sheet can be used for bonding to flat components, but special casting techniques are available which enable the photoelastic material to be obtained in a partially polymerised, very flexible, stage, and hence allows it to be contoured or moulded around complex shapes without undue thickness changes. After a period has been allowed for complete polymerisation to occur in the moulded position, the sheet is removed and bonded firmly back into place with the reflective adhesive. The reflective technique is particularly useful for the observation of service loading conditions over wide areas of structure and is often used to highlight the stress concentration positions which can subsequently become the subject of detailed strain-gauge investigations. In addition to the widely used methods of experimental stress analysis or strain measurement covered above, there are a number of lesser-used techniques which have particular advantages in certain specialised conditions. These techniques can be referred to under the general title of grid methods, although in some cases a more explicit title would be "interference methods". The standard grid technique consists of marking a grid, either mechanically or chemically, on the surface of the material under investigation and measuring the distortions of this grid under strain. A direct modification of this procedure, known as the "replica" technique, involves the firing of special pellets from a gun at the grid both before and during load. The surface of the pellets are coated with "Woods metal" which is heated in the gun prior to firing. Replicas of the undeformed and deformed grids are then obtained in the soft metal on contact with the grid-marked surface. These are viewed in a vernier comparison microscope to obtain strain readings. A further modification of the grid procedure, known as the moiré technique, superimposes the deformed grid on an undeformed master (or vice versa). An interference pattern, known as moiré fringes, similar to those obtained when two layers of net curtain are superimposed, is produced and can be analysed to yield strain values. X-rays can be used to obtain surface strain values from measurements of crystal lattice deformation. Acoustoelasticity, based on a principle similar to photoelasticity but using polarised ultrasonic sound waves, has been proposed but is not universally accepted to date. Holography, using the laser as a source of coherent light, and again relying on the interference obtained between holograms of deformed and undeformed components, has recently created considerable interest, but none of these techniques appear at the moment to represent a formidable challenge to the major techniques listed earlier. 1. A.J. Durelli, E.A. Phillips and C.H. Tsao, Analysis of Stress and Strain, McGraw-Hill, New York, 1958. 2. Magnaflux Corporation, Principles of Stresscoat. 3. E.J. Hearn, Brittle Lacquers for Strain Measurement, Merrow Publishing Co., Watford, England, 1971. 4. C.C. Perry and H.P. Lissner, Strain Gauge Primer, McGraw-Hill, New York. 5. T. Potma, Strain Gauges, Iliffe, London, 1967. 6. E.J. Hearn, Strain Gauges, Merrow Publishing Co., Watford, England, 1971. 7. R. Murray and P. Stein, Strain Gauge Techniques, M.l.T. Press, Cambridge, Mass., 1956. 8. EJ. Hearn, Photoelasticity, Merrow Publishing Co., Watford, England, 1971. 9. M.M. Frocht, Photoelasticity, vols. I and II, Wiley. 1961. 10. H.T. Jessop and F.C. Harris, Photoelasticity, Cleaver-Hume, 1949. 11. E.G. Coker and L.N.G. 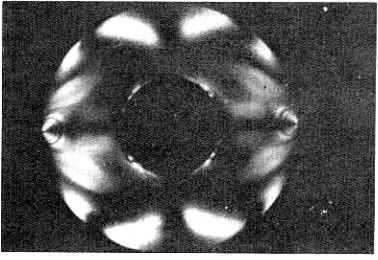 Filon, Photoelasticity, Cambridge University Press, 1957. 12. F. Zandman, S. Redner, J.W. Dally, Photoelastic Coatings Iowa State/S.E.S.A. 1977. 13. J. Pople, B.S.S.M. Strain Measurement Reference Book. B.S.S.M. Newcastle, England.